DAVID LE/Staff photo. 5/15/15. 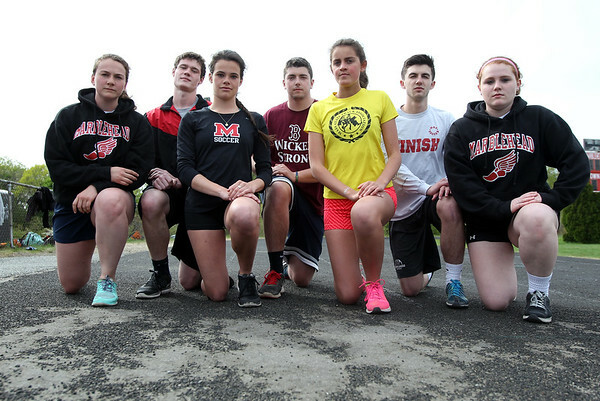 From left: Marblehead High School senior boys and girls track captains Julia Lothrop, Chris Brady, Carlyn McGrath, Dan Marino, Kat Huber, Harry McDonough, and Faith Ferrucci kneel beside part of the track at the Village School that has been worn down to cement. The track behind the Village School in Marblehead, which is used by both the Marblehead High School boys and girls track teams is in need of serious repair. On parts of the track, the surface has been worn down to pavement, and one of the lanes is unusable. The Marblehead All-Sports Committee has raised approximately $475,000, but they will need to raise an additional $100,000. If the track is not fixed in the next year, Marblehead will not be able to host home track meets.